As members of the Society for Creative Anacronism, Inc., we strive to recreate the customs, courtesy and combat of the Middle Ages (pre 1600 AD). The SCA is an international organization dedicated to researching and re-creating the arts, skills and traditions of pre-17th-century Europe. 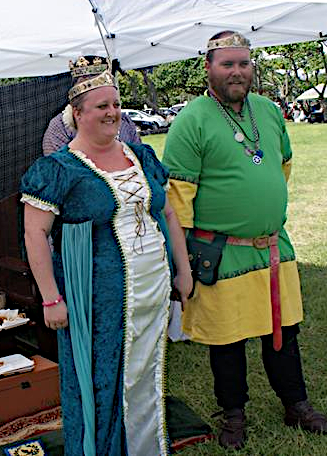 Members of the SCA study and take part in a variety of activities including, armored combat, archery, costuming, cooking, metalwork, woodwork, music, dance, fiber arts, and much more. You are not required to purchase an SCA membership before attending SCA meetings and events. Membership is a requirement for holding office in SCA groups, for participation in combat and combat-related activities in some kingdoms, and for eligibility to receive awards in some kingdoms. Single memberships start out at $22 per year and can be filled out securely online at our corporate website or contact the seneschal for more information. New members and visitors are always welcome. Contact the Chatelaine or the Seneschal for Information. If you are new to the SCA and would like to learn more about what we do or how we do it, visit the “New to SCA?’ section of the Caid Kingdom web page by pressing Here.